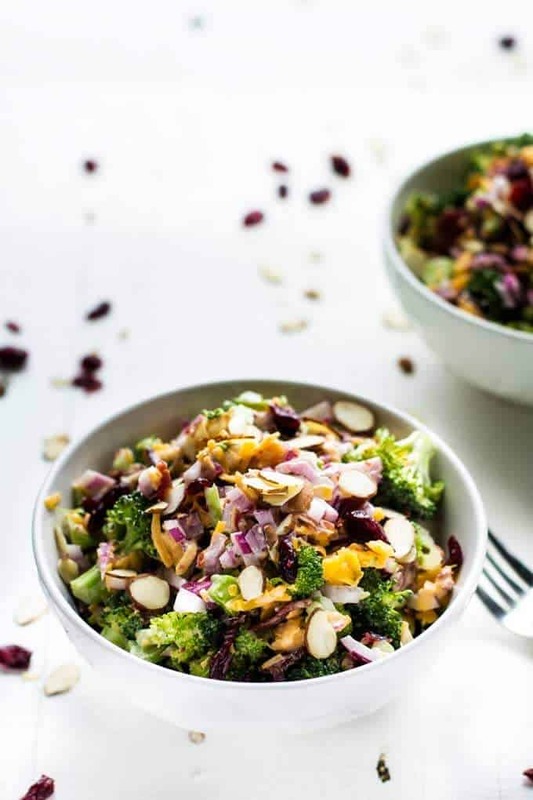 This Broccoli Salad with Bacon and Cheddar cheese is a healthy broccoli salad that doesn’t require sacrifice. 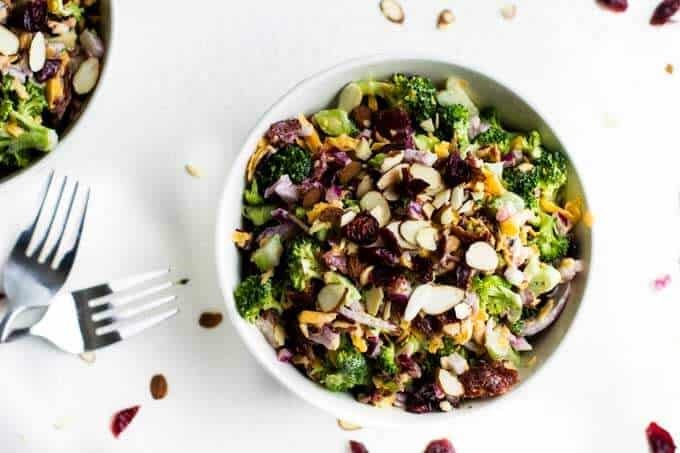 With crunchy broccoli and almonds, crispy bacon, a touch of bite from red onion and a hint of sweetness from dried cranberries and the yogurt mayonnaise dressing, this crowd pleaser will soon become a favorite. Gluten free with a vegan option. To me, few things are more satisfying than a delicious salad. So you might be surprised to learn that I rarely order a salad when eating out. I find that all too often, salads disappoint. Bland dressings, produce that is slightly past its peak or flavorless. If you are a salad snob (totally a thing) like me, you know what I mean. Because of this, I make a looot of salads at home. Most of the time I stick to the same basic formula. Greens, healthy protein, three or four veggies that vary depending what I have on hand and a homemade dressing. Sometimes I add in a little cheese or half of an avocado. Lately, I’ve been trying to get more raw vegetables into my diet. The challenge is that after I’ve had a big salad for lunch, more raw vegetables for dinner just isn’t appealing. Enter this Broccoli Salad with Bacon and Cheddar Cheese. And while I don’t fear fat, if you are trying to avoid fat in your diet you can skip the mayo altogether and just use Greek Yogurt. 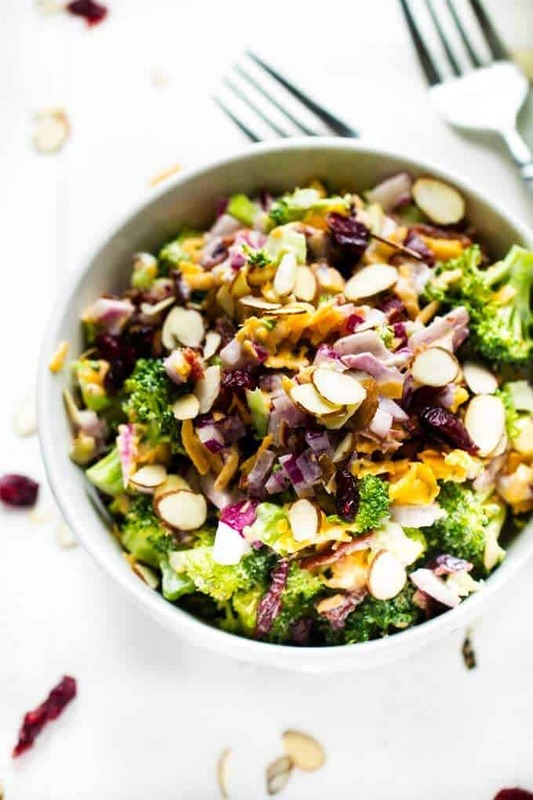 Either way, you are going to love this healthy broccoli salad with bacon and cranberries! 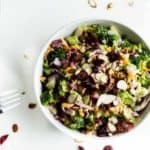 This Broccoli Salad with Bacon and Cheddar cheese is a healthy broccoli salad that doesn’t require sacrifice. 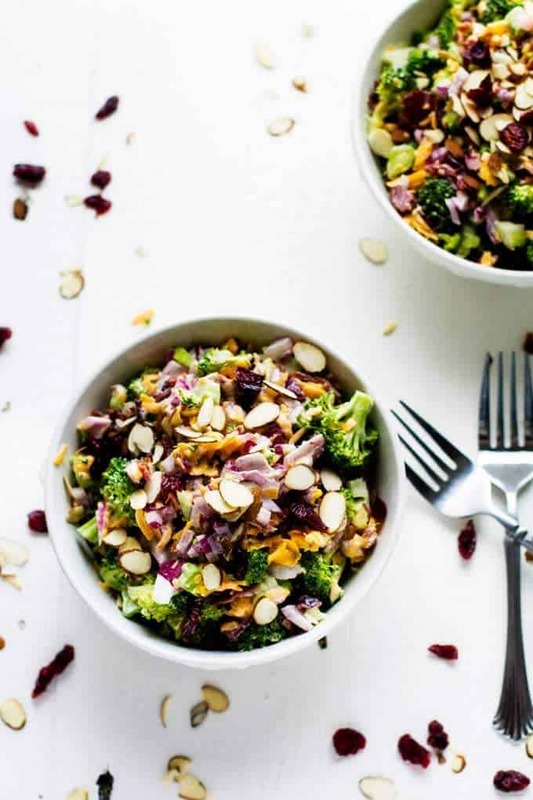 With crunchy broccoli and almonds, crispy bacon, a touch of bite from red onion and a hint of sweet from dried cranberries and the yogurt mayonnaise dressing, this crowd pleaser will soon become a favorite. Gluten free with a vegan option. 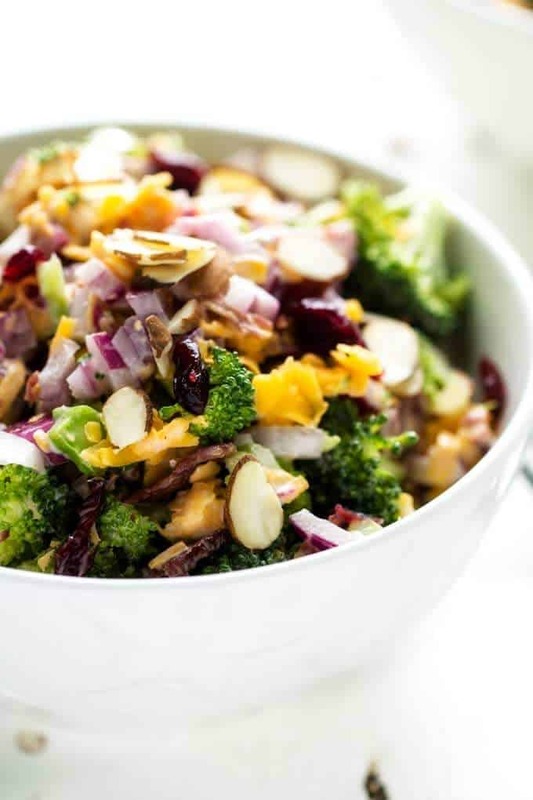 In a large bowl combine broccoli, bacon, onion, cheese, and cranberries in a large bowl. In a small bowl, whisk together yogurt, mayonnaise, red wine vinegar, salt, and pepper. Add dressing to the large bowl and toss to combine. Top with almonds and serve. Omit the almonds and substitute an equal amount of pine nuts. Toast the pine nuts in a skillet over medium heat for 7 to 10 minutes. Omit the cheddar cheese and use three ounces of cubed fresh mozzarella cheese. Reduce the almonds to 1/4 cup and add 1/4 cup salted sunflower seeds. Now this right here s m y kind of salad.